(Nanowerk News) Electrochemical capacitors (ECs), also known as supercapacitors or ultracapacitors, differ from regular capacitors that you would find in your TV or computer in that they store sustantially higher amounts of charges. They have garnered attention as energy storage devices as they charge and discharge faster than batteries, yet they are still limited by low energy densities, only a fraction of the energy density of batteries. An EC that combines the power performance of capacitors with the high energy density of batteries would represent a significant advance in energy storage technology. 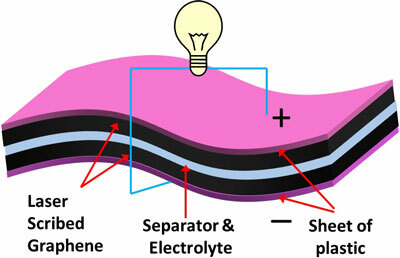 This requires new electrodes that not only maintain high conductivity but also provide higher and more accessible surface area than conventional ECs that use activated carbon electrodes. Schematic showing the structure of laser scribed graphene supercapacitors. UCLA researchers from the Department of Chemistry and Biochemistry, the Department of Materials Science and Engineering, and the California NanoSystems Institute demonstrate high-performance graphene-based electrochemical capacitors that maintain excellent electrochemical attributes under high mechanical stress. The paper is published in the journal Science ("Laser Scribing of High-Performance and Flexible Graphene-Based Electrochemical Capacitors").